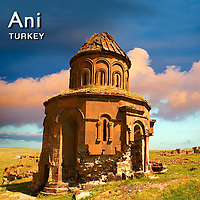 Pictures & images of Ani archaeological site, Turkey. Ani is a ruined and uninhabited medieval Armenian city-site situated in the Turkish province of Kars, near the border with Armenia. It was once the capital of a medieval Armenian kingdom that covered much of present day Armenia and eastern Turkey. The city is located on a triangular site, visually dramatic and naturally defensive, protected on its eastern side by the ravine of the Akhurian River and on its western side by the Bostanlar or Tzaghkotzadzor valley. Called the "City of 1001 Churches", Ani stood on various trade routes and its many religious buildings, palaces, and fortifications were amongst the most technically and artistically advanced structures in the world. At its height, Ani had a population of 100,000-200,000 people and was the rival of Constantinople, Baghdad and Cairo. The Persian Safavids ruled Ani until it became part of the Turkish Ottoman Empire in 1579. A small town remained within its walls at least until the middle 17th century, but the site was entirely abandoned by the middle of the 18th century. Download pictures and images of Ani on line or buy Ani pictures as photo art prints.